Ela Rogers is a belly dance artist, choreographer, and instructor, internationally known for her unique and dramatic musical interpretations, experimental fusion, her graceful and powerful technique, and her talents in the fine arts and costume design. Baseema and Mathura are hosting Ela in a workshop and show on Saturday, March 14 at the Dance Complex in Cambridge. You started out learning/performing Egyptian style dance…how has this influenced your current style? It’s funny...I was initially bitten by the belly dance bug after seeing Tribal Fusion style belly dance. Actually, it was when the Bellydance Superstars were in New York in 2005 for a guest spot on the TV morning show “Regis and Kelly”, showcasing a trio of the company’s multi-styled dancers. Being a novice to belly dance, I was unaware that there were different styles! 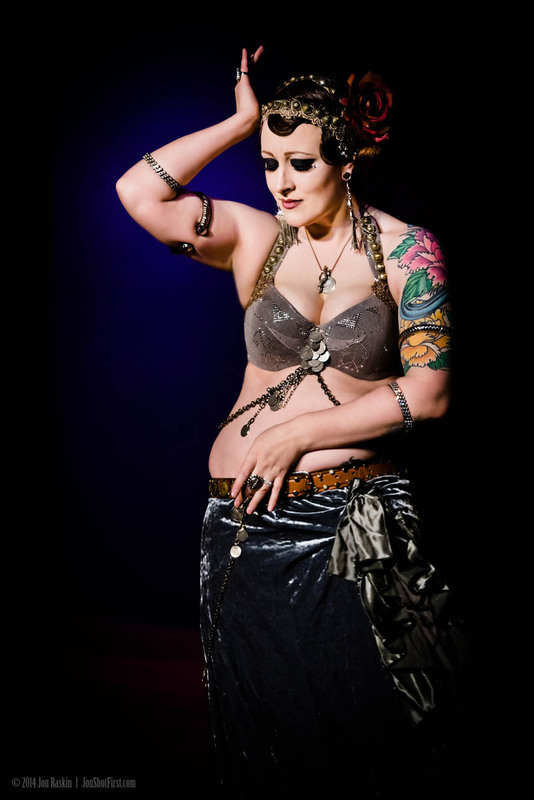 I instantly connected to Tribal Style, after bearing witness to the jaw-dropping confidence, exquisite muscular control and articulation of the body, the earthy and (what I thought was) an almost rebellious image juxtaposed with the classic Egyptian and cabaret dancers. After all, I’ve always been a tomboy who has marched to the beat of my own drum, and to me, this style made me feel accepted and comfortable in my own skin. I could barely contain myself and wished to begin training right away, but soon discovered that there were no Tribal Style teachers in my area. I felt it was imperative to just enroll myself in the nearest classical belly dance class, which was Egyptian style. Once enrolled, I soon realized the importance of learning the basic history and movements of this ancient dance, how it felt on my body, and where the components originated. Studying with the delectable Elena El Amar was just what my soul needed at that point in my life. She is an amazing teacher and woman, who dances within what seemed to be a magical white light, her heart and eyes just illuminated with passion, emotion, and playfulness that embodies the Egyptian-style dance that she dearly loves. To this day, those are the qualities that still influence my dance. Even though I am a fusion artist, I firmly believe in the importance of intelligent fusion that I define as “know the rules before you break them.” I always carry awareness and respect for everything in my movement repertoire, and meld with care and creativity. That is what it’s all about for me. One can always build atop a strong foundation. You are self-taught in Tribal Style. Can you talk about your process? Well, thank you! It’s something that I’ve worked hard for. Limitations are sometimes what we perceive; just because I didn’t have a Tribal Style belly dance teacher from which to take weekly classes didn’t mean that I could not work towards my goal of learning this style. Having backgrounds in classical ballet, jazz, modern dance, and martial arts surely gave me a platform for cultural dance. I had to become resourceful to seek out any forms of instruction. I placyed Fat Chance Belly Dance instructional DVDs daily in my home, along with other Tribal Fusion-style instructional videos for my practice. Being honest, I also had some set-backs. Still being new at this point to belly dance, I would get overzealous imitating movements that I had seen in Tribal Style dance performances but that I hadn’t yet learned, and was inflicted with numerous injuries. The top two that took the cake were a sprained back and a pretty serious abdominal strain that finally resulted in a six-month leave from dance. After physical therapy and chiropractic care, I slowly restored my body, and was coached in anatomy, strengthening, and injury prevention along the way. When not dancing, I filled my time with yoga, Pilates, and many hours of watching YouTube videos of belly dance performers of ALL LEVELS. To me, it was important to absorb it all, to discover for myself, how I envisioned perfecting my own dancing. One of my all-time favorite quotes by Claude Monet still keeps me motivated to this day: “It’s on the strength of observation and reflection that one finds a way. So we must dig and delve unceasingly.” Whether it’s honing your craft or seeking out inspiration…stay hungry and just keep digging! What is your teaching style and approach? What are your primary goals for your students? My approach in teaching is to invite my students to experience my movement material on their bodies in a safe environment, to have them relax, and then have them find emotion within themselves and to embody it in their own movement. This is what I found to be equally exciting and challenging when learning dance. When I’m the student, my intentions are to be receptive to the unfamiliar, but to remain open to explore. From there, you begin to perceive yourself in subtle nuances, further leading towards your feelings of identity. There is an emotional and spiritual side of dance within the mover, along with the anatomical side. A lot of my students hear my speech of my “Spider-Man Policy”, based on Spider-Man’s well-known phrase: “With great power comes great responsibility.” It’s what I use to engage my students to encourage the mindset of truly honoring and respecting one’s body as a dancer and athlete. If becoming a strong and healthy dancer is what you desire, and if you wish to dance efficiently for an extended length of time, one must be responsible and maintain strength, flexibility, and have a devoted practice. Above all, I deeply enjoy sharing my passion with people and being part of teaching something that is SO much bigger than all of us. It is history. It is dance. It is art and the creative process. Who are your top 3 dance influences? I would have to say that my main three influences who truly affected my development when I began my journey in belly dance would be: my first belly dance teacher, Egyptian-style dancer Elena El Amar; innovator of American Tribal Style belly dance, Carolena Nericcio; and Rachel Brice, who continued the lineage of the dance into Tribal Fusion belly dance. These women represent three different dance forms, and I admire their hard work, fearless determination, and dedication to their art and sisterhood. Through the years, they constantly reminded me to step up my innovation, practice more, to become as educated as possible, and to continue to keep setting goals. Currently, my inspirations change and flux all the time. I admire so many dancers and movers, outside of the belly dance genre, as well. Cyd Charisse is my current crush with her sinuous body lines and flow! Artwork - be it paintings, sculptures, or shapes and textures in nature - also heavily influence my dance.